Right about now your Pinterest feed is going to be inundated with pumpkin EVERYTHING. Right? But did you know there are some top notch ones for one particular meal? One of my favorite meals of the day will forever and ever be breakfast. Starting your day with a yummy delicious meal really can make the day just be awesome. And pumpkin can be used in so many different breakfast delights. Don’t believe me, go ask Pinterest :). I have discovered a pretty incredible one that I think will have to become a staple at least once or twice a week for sure. Actually, I’m pretty sure I could incorporate pumpkin into every one of my breakfast recipes from now until spring and be happy. Now I love a good eggs and sausage breakfast for sure, but make a waffle and I’m in heaven. Waffles really are my weakness. I love them! And I like them best when they have a crunch on the outside (see tip at bottom to help them stay crispy!). 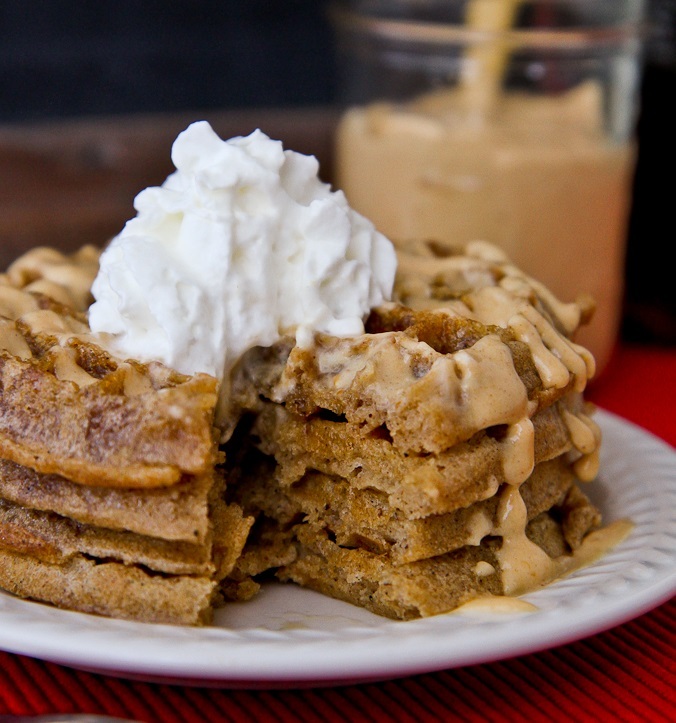 I hope you have a love of waffles because this pumpkin waffle recipe is one that is sure to be a new favorite! Pumpkin Maple Cream Cheese Topping…yes you may need this, so recipe is below! 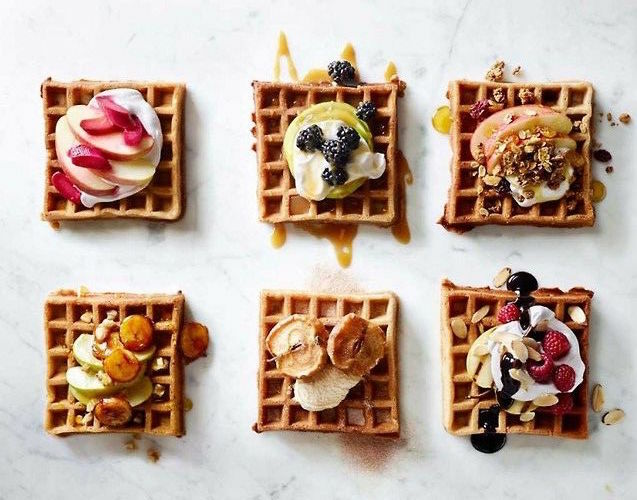 So fill your breakfast table with these delicious seasonal waffles and line the middle with bowls of fun toppings to add on. It will be sure to become the favorite breakfast for a cool saturday this fall. I’d love to hear what your favorite waffle toppings are to, share in the comments below! And Happy Fall! Little Waffle Tip: To keep the waffles crisp, place them on a cooling rack so air can circulate around them. Once you toss them on a plate, the steam build up will quickly lead to soggy waffles. If you are making waffles for a crowd, reheat waffles directly on oven rack at 350 degrees for 3-4 minutes. This brings the crispy back beautifully! 1 In the bowl of a stand mixer, whip 3 egg whites until stiff peaks form. Set aside. 2 Combine dry ingredients in a large mixing bowl and whisk together. 3 Combine milk, pumpkin, butter, egg yolk and vinegar in a small bowl and stir to combine. 4 Add pumpkin mixture to dry ingredients and stir to combine. 5 Gently fold in egg whites. 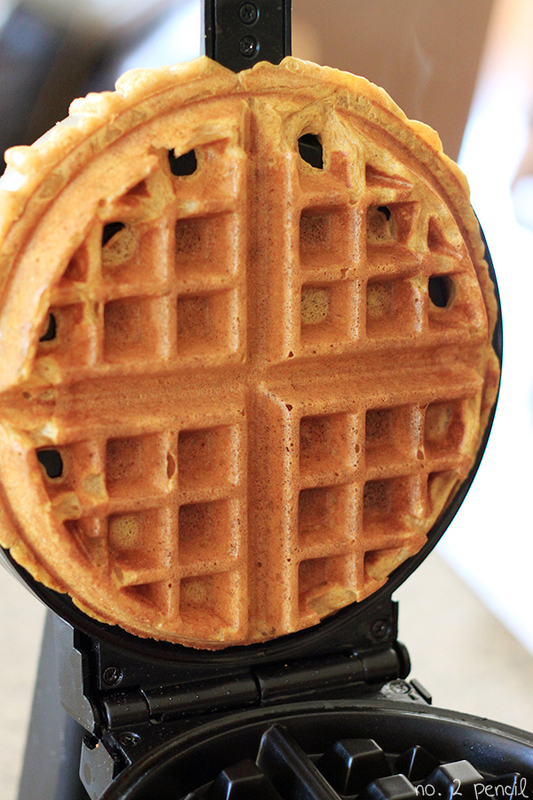 6 Use batter immediately in waffle maker. Combine all ingredients in a medium sized bowl and mix well with hand or stand mixer, until well combined. Mixture may be lumpy at first, continue to beat on high until mixture is smooth and well combined. Spoon on top of waffles or serve on the side for dipping. Store any extras in refrigerator.